Our skilled licensed massage practitioners offer a variety of styles including Swedish, Deep Tissue, Sports Massage, Aromatherapy, and more. Increase your quality of life by relieving stress and tension in your body. Call our office today to schedule an appointment with one of our professional Massage Therapists, call Inland Massage Institute at (509) 465-3033. To make an appointment, call Inland Massage Institute at (509) 465-3033. Saturdays and evenings by arrangement with the therapist. Please call in advance to schedule an appointment. To avoid charges, please provide at least 24 hours notice for cancellation. As a courtesy to everyone, please be prompt. Late arrivals can only be extended to the time remaining in their scheduled session. 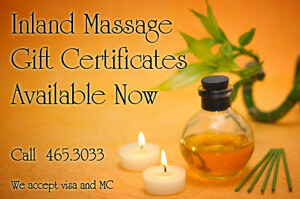 Gift Certificates for all services available on line. Go to our Gift Certificates on the tool bar. This is a traditional Swedish based massage that uses light-to-moderate pressure, with techniques varying from gliding to kneading that creates a relaxing and therapeutic experience. Massage is more than a luxury. It promotes health by relieving stress, reducing muscle tension and increasing your overall energy and vitality. Stronger, more localized movements target deeper muscle tensions for pain relief and faster recovery from repetitive strain injuries. Deep tissue massage can relax tight muscles and improve range of motion as shorten tissues are gently stretched and lengthened. When vigorous exercise leaves your muscles feeling fatigued, stiff and sore, massage can help. Many sports and fitness enthusiasts rely on regular massage as an important part of their health maintenance routine. A massage is also a great place for you to relax. Just for Mom2B. A special prenatal massage made with mommies in mind. This massage uses specially designed movements to increase circulation and provide relief from swelling and cramping during pregnancy. Stone massage is combining the time-proven healing therapies of hot and cold applications and therapeutic massage. Used in relaxing spa treatments as well as for chronic tension and pain. Massage with smooth, heated stones, sometimes contrasted with cool ones, is a nurturing experience beyond compare. Full or partial body treatment using hot smooth stones to deeply relax. A wonderful experience that can be done by itself or combined with a massage or facial. Body scrub or Salt Glow, 15 minute Sunspectra session, Facial Clay and Herbal Mask, and 25 minute Relaxation Massage. Body Scrub or Facial Mask, 15 minute Sunspectra session, 50 minute Relaxation Massage. 25 minute Relaxation Massage with a Facial Clay and Herbal Mask. 25 minute Foot and Lower Leg Massage with Salt Glow or Hot Stone Foot Treatment. 50 minute treatment including Facial Clay and Herbal Mask and Massage of the Face, Neck, Shoulders, Hands, and Feet. Skin feels at its best when it is smooth and hydrated. The use of creamy exfoliate is used to remove the surface dead skin cells in this 25 minute treatment. 25 minute exfoliation treatment to remove dead skin cells from body and leave the skin looking fresh, smooth, clean and polished.